In an unbelievable race that was predominantly made up of ugly, personal attacks, the circus that was the U.S. presidential election is finally over. Rejecting political norms and winning states that Republicans have typically never won, Donald Trump, in a shocking turn of events, is now president-elect of the United States. Everyone, particularly those in Hyde Park, seems to be stunned and in disbelief. While the uproar and outcry is sure to continue, many are actually claiming that a Trump presidency is actually good, citing that since he has been elected, the stock market has soared. However, this falsely equates numbers on a stock board to Trump’s potential as a leader. The market does not necessarily reflect a strong, unified country but rather reacts to possible projections of the future. It is not some objective gold standard-bearer of progress, but is driven by human emotion and opinion, both of which are fallible. Prior to the election result, the mere idea that Trump could win the presidency caused the S&P 500 Index to fall 5.3 percent in two days. Dow futures had plummeted nearly 400 points; sectors that were predicted to be hit the hardest range from consumer stocks to transport and healthcare stocks. Consumer stocks in particular will likely be hurt because of his intended immigration restrictions on Muslims, which would constrain labor supply and consumer demand. Yet, after the initial shock that occurred when Trump became the president-elect, the stock market turned for the better. Most indexes from the DJIA to S&P rose, as investors became more optimistic in the markets. President-elect Trump has promised a big boost in spending on defense and infrastructure; given this, companies that engage in civil infrastructure could rise due to a greater demand for government work. The same goes for Trump’s claims to loosen environmental policies and his investment in the fossil fuel industry, which could spur the energy sector upwards. Essentially, investors are for the most part optimistic about what Trump’s loosening hold on regulations could do for the economy. The U.S. has responded, but they have responded to a president-elect who continues to rapidly change his policies on a myriad of issues. Despite these concrete numbers of stock prices, interest rates, and more, which appear to starkly illustrate the present and possibly the future state of the economy, Trump has not concretely done anything. His team is in disarray, with near-constant hirings and firings; the president-elect and his team are still in transition. The reason why the markets are moving is thereby not because anything tangible has happened, but because of investor sentiment. 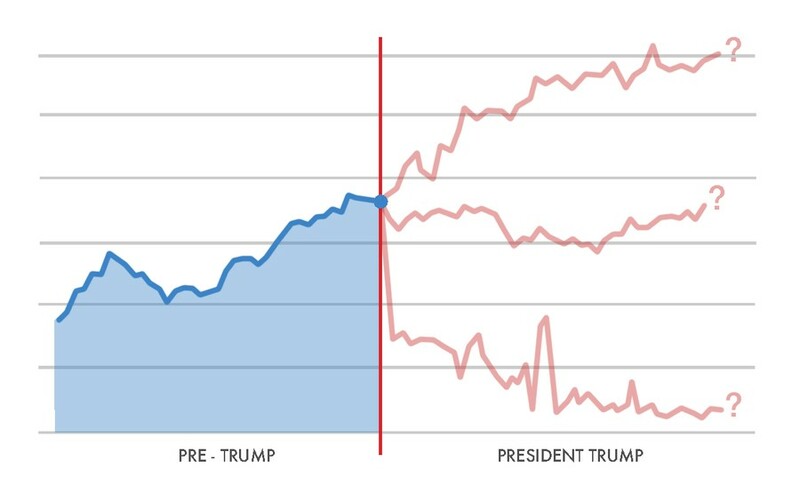 Before he was elected, investors believed that the notion of a Trump presidency would be disastrous, leading to a plummeting market. But, after the “dreaded” event actually occurred, the markets seemed to wrap their heads around the idea of President Trump to the point that they saw something that could potentially work in their favor, leading to the economic upturn we’ve seen. These are mere projections and hopes for the future, not any indication that Trump is actually an effective leader and a strong businessman. To use the economy to argue in his favor is vastly misguided and wrongly turns the conversation away from ill-framed policies and disastrous issue positions. Jasmine Wu is a second-year in the College majoring in economics and philosophy.